BoardGaming.com> Games> Card Games> Sushi Go Party! We heard your requests… You want more Sushi Go! Well here it is, you got more Sushi Go! This deluxe edition features lots of opportunities to customize your playing experience. You’ll find that while the overall game is basically the same, the variety of cards offers many new opportunities. You’ll also notice that the strategy changes from game to game. It's a party platter of mega maki, super sashimi, and endless edamame in this expanded version of the best-selling card game. You still earn points by picking winning sushi combos, but now you can customize each game by choosing a la carte from a menu of more than 20 delectable dishes. What’s more, up to 8 players can join in on the sushi-feast… let the good times roll! Toucan Play that Game Plays Through Sushi Go Party! Board Game Sanctuary Review & Play Through of Sushi Go Party! Sushi Go is a fun fast card game that is a pick pass and play style so strategy is based on collecting what you need, but also paying attention to stopping your neighbour from completing a set. I enjoyed playing it, until I was invited to the Sushi Go Party! This expansion improves the game 8 fold! Not only can more players join the feast, but the ability to mix up the cards you use means the expansion has much more replay value. The game suggests several combinations that work well, but we’ve found randomly selection is also a treat. A fun game for adults and children (fair warning some of the mechanics for points might be confusing to the littlest in your group) Some of the ‘special’ cards can be confusing to first time players, regardless of age, but most everyone catches on quickly in the first round. The art is delightful, and the style of the board and components are sturdy. My only complaints are the scoring track is narrow if you’ve got more than four players and the vacu-form insert for card storage does not allow you to keep cards sorted, we all wish it was more like the dominion inserts. Really the only downside is that playing makes me hungry! 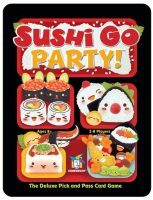 I love sushi and I love to party, only makes sense that I would love Sushi Go party. Easy to Learn, easy to play, and the different items you are now allowed to add on the menu compared to Sushi Go (regular) adds so much variety and replayability to the game. Great with all player counts, my gf and I have a blast playing it with just the two of us, and works great at 8 players since there really is no downtime between turns. Games are quick, turns are quick, go have yourself a party with this game…a sushi go party. Add a Review for "Sushi Go Party!"